Excerpt from my book, Catching Brilliance, Simple Reflections to Nurture the Soul. ©Wendy Dewar Hughes. Click image to see more. I like staying in my comfort zone — at least some of the time — and making it all prettier. Beauty lifts our spirits, gives us hope, and adds joy to what can otherwise be a dark day or a difficult time. One of the first things you can do to make your life prettier is simply to neaten up your surroundings. I’m not talking about a major overhaul, Marie Kondo-ing your entire house and garage, or spring-cleaning your basement. The goal here is simply to neaten up the spaces where you spend the most time. I make no secret of the fact that as a creative person I can be quite messy. “Out of sight, out of mind” is the truth for me. If I can’t see it, I might not remember where it is, or even that I own it. I also like a lot of visual activity in my surroundings, but it can definitely get out of hand. 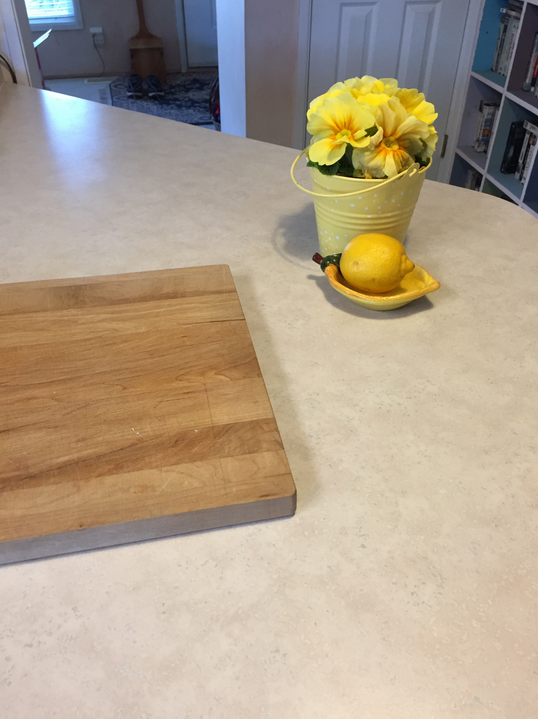 When my daughters were young, I had a small home-based business that required clients to come in my front door and walk through to the kitchen. Since we lived in our entire house that meant the spaces often needed to be tidied up in a hurry. I developed what I called “The Quick Clean”. We’d grab a laundry basket, toss all the toys in it and take the basket upstairs. All the reading material, which would come out again later, went under the sofa. A feather duster whisked the surfaces, and voilà! A tidy room. What I’m recommending now is similar but a bit different, and still quick. Take a good look at the room you want to neaten, or take a photo with your phone. Pick out the things that don’t belong or that make the room look messy. Choose one category, for example, books, and pick them all up. Either shelve them, or deliver them to their owners. Choose the next item, perhaps clothes and shoes, and do the same. Continue until everything has been picked up and put away. Make the bed, fluff the cushions, flick the dust off the furniture, and straighten chairs and lamps. You'll probably find that once you get going, the job takes much less time than you may anticipate. 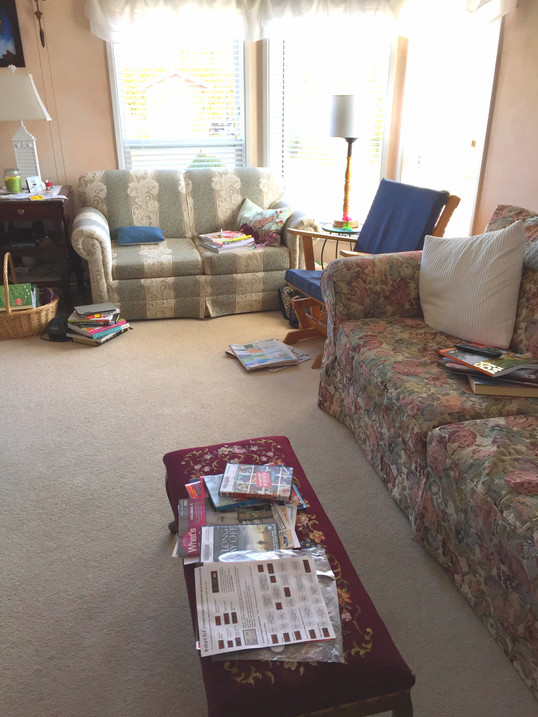 BEFORE: This is my living room on an average day during a busy week. I have lots of books and magazines in varying degrees of use. My husband drops newspapers on the floor. Library books come into my house with regularity. I also have too much furniture at the moment, but that's another story. BEFORE: This is the counter than catches everything. Every home has one of these spaces, in the kitchen, by the front door, wherever. Receipts, instruction booklets, a phrase book, coffee grinder, my fresh fruit bowl — without fruit — the bread basket were deposited here. 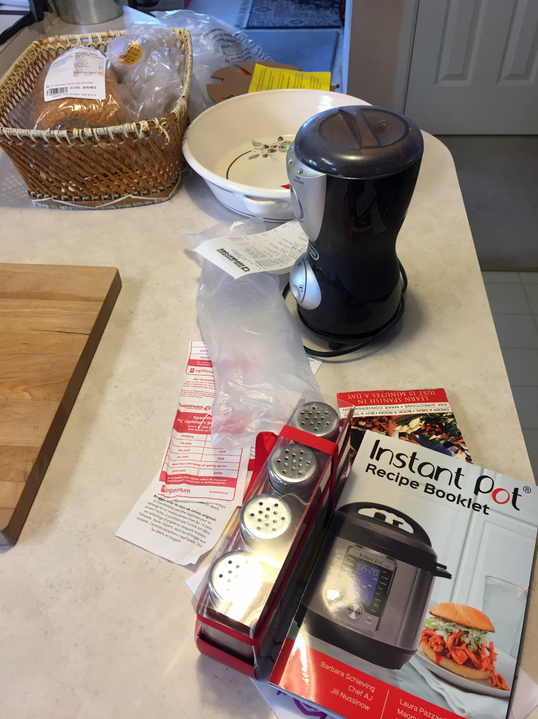 There is even some packaging (from my new Instant Pot) that needs to be tossed, since I decided to keep the appliance. (I wanted to try it first. AFTER: Here is the room after I collected all the things lying around and deposited in their rightful places. I shelved all the books and videos. I tossed the newspapers and flyers into the basket where they are collected for recycling. I also fluffed and arranged the throw cushions. It took only five minutes. AFTER: This is the counter that was previously buried in clutter. I tossed the packaging, put the instructions next to the appliance, shelved the phrase book, and put away the coffee grinder and the bread basket. It took less than five minutes. ​​How much prettier it looks with the bright yellow primula and lemon. 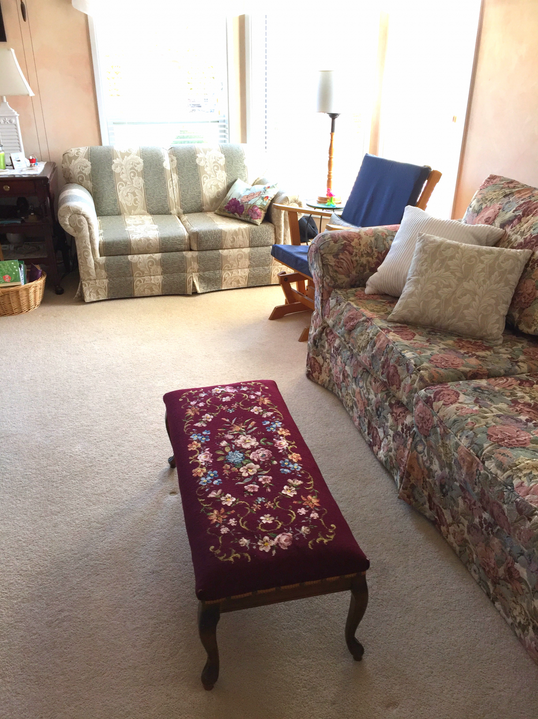 Immediately after I finished this quick tidy-up, my aunt phoned. She was in my area for a couple of days for a meeting and wanted to drop by. So you see, it helps to have a pretty quick clean up strategy because you never know when you may need it. Be sure to visit my store, Summer Bay Studio, to see what is new this week. And subscribe to my weekly newsletter below to stay up on all the fun, creative things happening here. I think you'll like my book, Catching Brilliance. Click HERE to look inside.